Assuming Sora and Riku will get new duds for DDD volume 2, what do you guys think they'll look like? Personally I want TWEWY style clothing for Sora and Versus clothing for Riku. Give me a clothing system tbh. I'll just choose what Sora and Riku should wear like in TWEWY when I put everybody in a nice pair of heels and a girl's school uniform, kimono, or really any of the cute women's clothes for the best stat boots. I don't really think they need a clothing change. I think KH3's clothes are urban enough to fit in Shibuya and Shinjuku, especially considering Yozora's own design. This. Came here to say exactly the same thing, and the precedent the series has of re-utilizing designs (especially if Nomura has grown attached to said design). It's not just a matter of if they will fit in with the environment though. They get new outfits for each big game in the series. 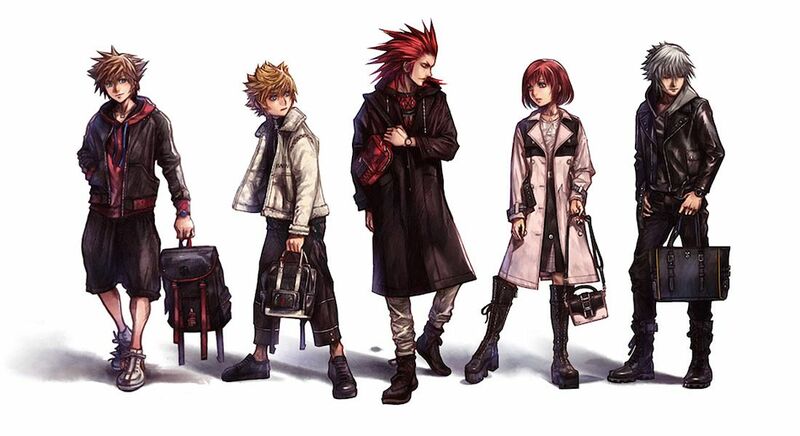 Even if this takes place before KH4 I think they're qualified for some new clothes. I don't see them changing outfits just yet, but I would like if Riku wore something that didn't look like a rejected Sora design. If I can't do this then what's even the point of going to TWEWY, ya know? Sora with normal pants is all i want but since Sora and Riku are only getting older with each game. I would just like the clothes to continue to reflect that. Then I should clarify a bit. I think their clothes we’re intentionally designed with this future project in mind. This is why I’m fairly comfortable with the idea that Sora and Riku won’t get new ones. If they do, though, awesome! Right? Let us dress Sora and Riku up! I mean, I'm okay with the notion of Sora not getting another outfit. KH1!Sora has been utilized waaaaaaaaaay more than KH2!Sora. And they could have re-utilized DDD!Sora's outfit. Honestly, I think Nomura really disliked KH2 Sora’s design and was trying to run away from it at every opportunity given to him. We definitely could have seen KH3D’s design again. This is honestly why I wish a costume system would be implemented haha. A customization option is welcomed. At least try small with 0.2's system. If it's well received, then do it again. I think they should stick with the KH3 design. I mean we just got it, why run away from it so fast? All I want to have is Sora wearing some Mickey Mouse ears when interacting with other characters. It would be nice to see the accessory customisation from 0.2 return. Yes, please. A lot of modern games offer this option. If not, then just give appearances to the Equipment the characters wear. Make them visible on the player. They worked so hard on that system for 0.2, too. It’d be the perfect thing to implement in KH3 as a part of one of the updates or in the DLC pack. I wouldn't mind if Sora and Riku were aged down (temporarily or for good) again. Going back to the original designs of the characters in 3D and coded was refreshing. I don't mind if they keep the KH3 outfits since I liked them, but I'm always up for new clothes, too. I don't think we'll see a clothes change for Sora and Riku. Their clothes are very suiting for Shibuya. If anything, I can see Riku maybe getting a new set of clothes to prevent him from constantly being mistaken for Yozora. If the rest of the gang end up in Shibuya however, I would love to see them get some Shibuya-style clothing. Maybe they can put a coat on him like in the art above, and presto. That's also assuming Yozora's design doesn't change.